If you’ve decided to take a romantic weekend getaway to Carmel-by-the-Sea after reading our article about all the wonderful things that the town has to offer, this list of romantic hotels and inns is the perfect place to start planning your trip. 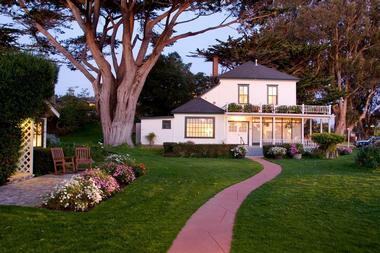 Choose from a weekend stay in a historic inn, beautiful B&B or a stylish hotel with ocean and beach views. Many of the properties on our list are pet friendly if you decide to bring your dog. Hyatt Carmel Highlands is a picturesque retreat that provides guests with spectacular views of the coast and the Pacific Ocean, and boasts all the amenities of a boutique hotel. Wireless Internet is available throughout the property, and guests can choose between a room with a view, a suite, or an extended stay. All rooms have DVD players, robes, daily newspapers, coffeemakers, hairdryers, irons, flat screen TVs, and iHome stereos. Hyatt Carmel Highlands has a heated outdoor pool, an on-site spa, bike rentals to explore nearby areas, and yoga classes. It also features a 24-hour fitness center, and babysitting and concierge services are available. Guests can dine at the Pacific’s Edge Restaurant, California Market, or have a drink at the Sunset Lounge. Located in a luxurious mansion from 1905, La Playa Carmel has been referred to as the “Grande Dame of Carmel” for a century. The hotel is newly restored and features 75 rooms just a few steps from local attractions and the beach. The rooms all offer a gorgeous view of the estate, garden, or ocean and have been individually designed. The hotel has intimate patios, beautiful gardens, a terrace swimming pool, and secluded courtyards. Guests can enjoy the Champagne Breakfast Buffet or grab a bite in the hotel’s Bar and Lounge. The staff can help guests arrange a nearby wine tasting or beach picnic. 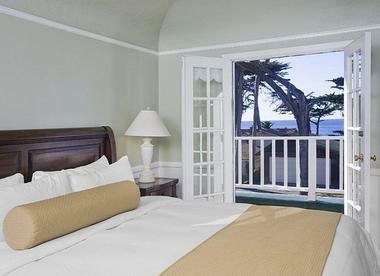 Renowned for its graceful architecture, style, and elegance, L’Auberge Carmel is a historic hotel located in the heart of Carmel-by-the-Sea just blocks from the famed Carmel Beach. Built in 1929, the Hotel boasts a European grandeur with individually designed guest rooms, an award-winning restaurant, and outstanding service. Blending romantic old-world charm with luxurious modernity, guest rooms feature beautiful French windows and coved plaster walls alongside modern updates such as flat-panel televisions, Bose® docking stations, and wireless Internet access. Spacious en-suite bathrooms feature hand-hammered copper sinks, antique travertine tiles, and custom bath products, while luxurious designer beds promise absolute relaxation. Dine at the award-winning Aubergine where Executive Chef Justin Cogley creates superb cuisine. You can also enjoy a range of in-room spa services or a sunset sail on the Monterey Bay with one of the hotel’s curated guest packages. 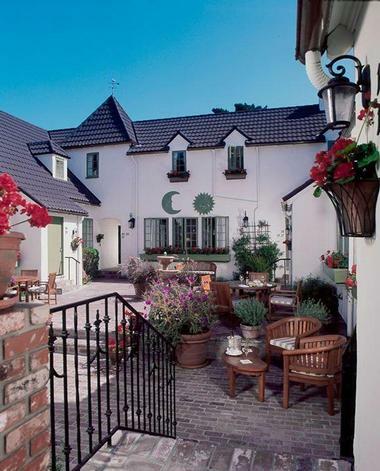 Carmel Country Inn is a comfortable bed and breakfast-style inn in Carmel-by-the-Sea that offers guests a pet-friendly, home-away-from-home seaside escape. Charming guest rooms range from luxurious one and two-bedroom suites to luxury queen and king studios, all of which are decorated in a classic country inn style. Suites and studios feature beautiful four-poster beds made up with plush linens, lovely en-suite bathrooms with showers and soaking tubs, spacious living areas, and modern amenities, including flat-screen TV/DVD players. Some suites enjoy crackling fireplaces and private balconies with garden views, and guests can take advantage of a range of indulgent in-room spa treatments and massages. The day begins with a sumptuous breakfast on the shady patio or in the comfort of your room, and a variety of homemade snacks and beverages are available throughout the day. You may also like: 20 Best Things to Do in Carmel. 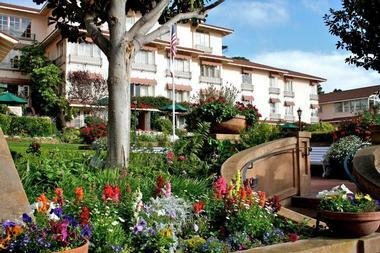 The Carmel Mission Inn is a stylish Tuscan-style hotel in a beautiful garden setting. 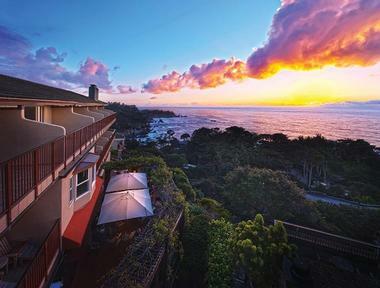 Located just two miles from Carmel-By-The-Sea off the Pacific Coast Highway, the hotel offers contemporary accommodations with modern amenities, fine cuisine, and a range of premier facilities for guests to enjoy, including a heated swimming pool, a hot tub, and a fitness room. The spacious rooms feature comfortable beds, en-suite bathrooms, televisions, mini fridges, coffeemakers, and convenient workspaces with free Wi-Fi. Some rooms have private balconies with lovely views over the hotel’s lush gardens while others boast extra living room space. 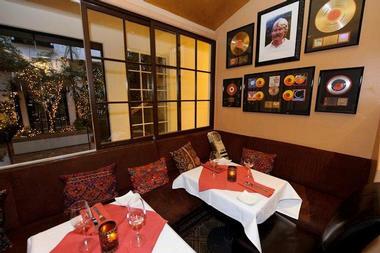 The Fuse Lounge Café serves breakfast and dinner in a contemporary dining space with stacked stone fireplace, and guests can enjoy specialty cocktails and signature entrées while listening to live music on the weekends. The Carmel Mission Inn is conveniently located within walking distance of the area’s popular attractions such as Cannery Row, the Monterey Bay Aquarium, and Fisherman's Wharf. The Vagabond’s House Bed and Breakfast Inn is an English Tudor-style country inn with a beautiful stone courtyard with ancient oak, hanging gardens, and cascading waterfalls – it’s a true escape from the world. The uniquely decorated rooms have period-style furnishings, hardwood floors, and spacious en-suite bathrooms with luxurious soaking tubs. They boast modern amenities, and some rooms offer full kitchens and/or fireplaces while luxurious suites have heated marble bathroom floors. 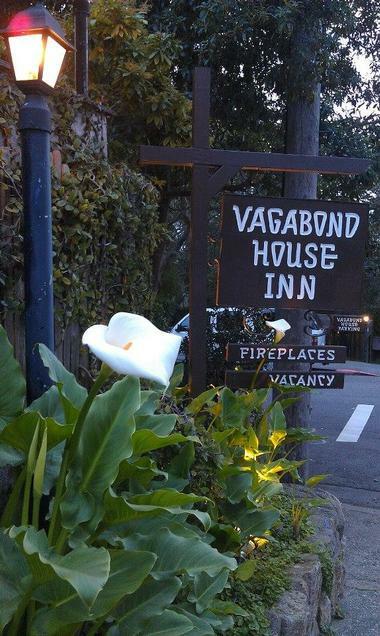 The Vagabond’s House Boutique Inn & Spa Studio offers guests indulgent body treatments, facials, and massages, and a complimentary wine and cheese reception is offered each afternoon. A hearty homemade breakfast is served every morning in the sun-dappled courtyard or in the comfort of your room, and there are several excellent restaurants within walking distance of the inn for dinner. The Candle Light Inn, located just a short walk from Ocean Avenue in the heart of Carmel, is a warm and welcoming bed and breakfast boasting 20 comfortable guestrooms and suites with modern amenities. Newly renovated rooms are spacious and light and feature comfy beds, plush carpeting, and lovely en-suite bathrooms, some of which have soaking spa tubs. Guest rooms and suites enjoy all the amenities needed for a relaxing holiday, including flat-screen cable TV, work desks, and free Wi-Fi. An inviting outdoor lounge area with a large fireplace provides the perfect spot to unwind on warm Carmel nights. The Candle Light Inn is a 15-minute walk from Carmel Beach, and the Pebble Beach Golf Course and Point Lobos State Reserve are both a 10-minute drive away. Tradewinds is an award-winning premier boutique hotel that has been offering guests an elegant oasis of calm and Zen-like escape for more than 55 years. Designed and built by Richard and Patricia Catlin and voted as one of the world’s top inns by Coastal Living, the hotel boasts a unique fusion of Asian and tropical design with luxury accommodations, soothing water features, and a lush meditation garden. Twenty-eight guest rooms are customized for comfort and have luxurious feather beds, silk pillows, imported linens, and Indonesian furnishings. Lovely en-suite bathrooms have spa jetted tubs, separate showers, and wet bars while certain rooms have private balconies and fireplaces. A sumptuous signature continental buffet breakfast is served every morning, and a cozy courtyard with a fire pit provides an ideal location for relaxing over sundowners in the evenings. Tradewinds Carmel is within close proximity to a variety of things to see and do, from shopping and dining to wine tasting, as well as attractions such as Pebble Beach, Monterey Bay Aquarium, Big Sur, and Carmel Valley. 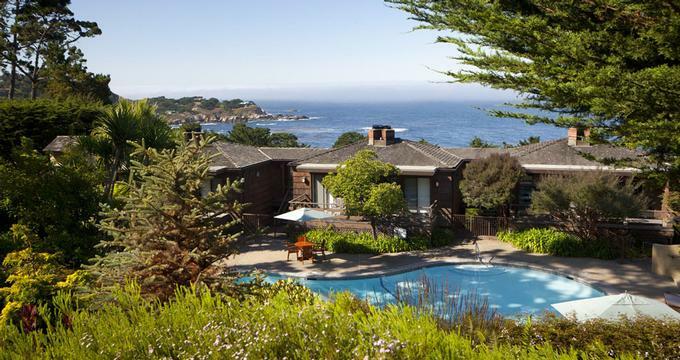 Tucked away in the lush Carmel Highlands overlooking the Big Sur coastline, Tickle Pink Inn is an enchanting coastal hideaway that has served as a tranquil escape for travelers for more than 60 years. Boasting breath-taking ocean views, luxurious accommodations, and a host of pampering amenities to cater to every need, Tickle Pink Inn promises an unforgettable stay. Ocean view guest rooms and suites are stylishly decorated with elegant European furnishings and soothing botanical hues of soft sage, emerald, and beige. Pacific Dreams beds are dressed in beautiful Italian-crafted Egyptian cotton linens, and luxury amenities range from plush terrycloth robes and slippers to a flat-screen HD LED TV with DVD library, in-room coffee service, and daily newspaper delivery. A deluxe continental breakfast of homemade pastries, fresh eggs, and gourmet coffee is served every morning on the sunny patio. 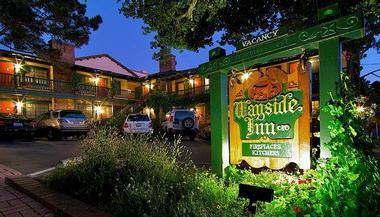 Just a short walk from the famous Ocean Avenue in the heart of Carmel village, Svendsgaard’s Inn is a family and pet-friendly inn that offers guests a comfortable and pampering stay. Surrounded by lush landscaped gardens, a beautiful shady courtyard, and a large heated swimming pool, Svendsgaard’s Inn is the ideal place for a relaxing, carefree getaway. 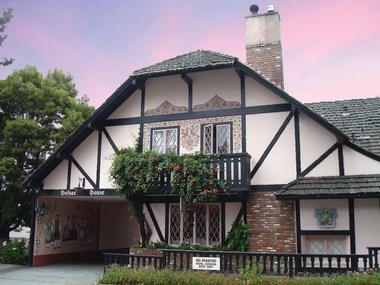 Nestled in the residential area of Carmel, 1929 Sandpiper Inn By the Sea is a comfortable inn perfectly located to offer both relaxation and an array of things to see and do in the village. Guests have a choice of Fireplace Rooms or Ocean View Rooms, both of which are beautifully decorated in country-style décor with comfortable beds, plush linens, ornate wooden furnishings, fireplaces, and/or lovely ocean views. Private bathrooms with tubs and showers are spacious and clean and an outdoor fire pit is a great locale to relax over drinks in the evening. Enjoy a sumptuous continental breakfast in the morning before heading out to explore the attractions in and around Carmel. You can try hiking at Big Sur, experience the wonders of Hearst Castle, or visit the beautiful Carmel Mission. Tucked onto a quiet side street one block south of the famous Ocean Avenue, the Carriage House Inn is an award-winning inn that offers guests an intimate and charming Carmel experience. Built in 1980, the well-appointed Carriage House Inn has been Carmel’s premier inn for over 30 years, offering luxurious accommodation, world-class dining, and exclusive shopping nearby. Thirteen spacious guest rooms and suites feature ornate ceilings and fireplaces, plush feather beds, en-suite bathrooms with showers, and spa tubs for indulgent relaxation and an array of modern amenities, including complimentary wireless Internet and a special turndown service. Guests can enjoy a delicious continental breakfast each morning and wine and hors d’oeuvres served in the library every evening, as well as a daily newspaper and personal valet service. This romantic inn five minutes from the beach has been recently updated and features comfortable amenities. There are 30 guestrooms in total, creating the atmosphere of a small and intimate hotel. Every room has recently gotten new linens, including a new bed skirt, decorative shams, beautiful duvets, cozy comforters, and new sheets. Most rooms also have new carpeting, and all guestrooms have an MP3 music player, plush robes, signature toiletries, microwaves, mini-fridges, Keurig coffee makers, and a large TV with a flat panel and DirectTV. The inn has a dry sauna and hot tub as well as wireless Internet. Guests get a complimentary breakfast buffet in the morning with hot, fresh dishes. There are freshly baked cookies, wine, and hors d’ouevres every afternoon. Mission Ranch is a historic hotel with 22 acres of land that include trails and picturesque views of the Pacific Ocean, Point Lobos, and Carmel River Beach. The ranch dates back to the 1800s, and today there are 31 rooms spread throughout ten buildings. All rooms have coffeemakers, bathrobes, televisions, hair dryers, and irons. All but one have refrigerators, and many also have gas fireplaces and whirlpool tubs. The property also boasts complimentary wireless Internet. 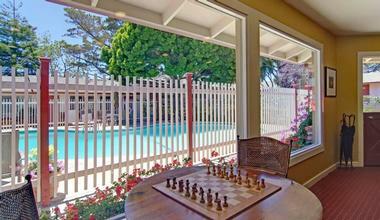 Guests have access to the Mission Ranch Tennis and Fitness Club, which is conveniently located on the property. They are also welcome to enjoy the complimentary pastries and coffee. The on-site Restaurant offers Sunday brunch, cocktails, and dinner. 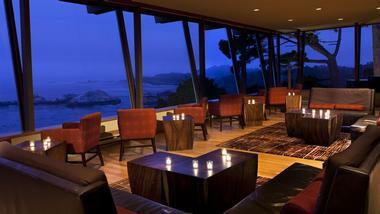 You may also like: 20 Best Things to Do in Monterey, California. The Colonial Terrace opened in 1925, making it one of the original hotels in Carmel. It is only 72 steps from the beaches and a slightly longer walk to the village. The hotel features 26 unique guestrooms and suites, and some of the ocean-view rooms have balconies to let you enjoy the view, or you can select a courtyard room. All rooms have plush terry robes, luxurious bath amenities, wireless Internet, coffeemakers, and refrigerators while most have fireplaces. Some also have kitchenettes or kitchens and whirlpools. You will also have TVs, irons, hair dryers, and complimentary bottled water as well as access to DVD players. The courtyard has landscaped terraces and several areas where you can relax. The day begins with continental breakfast in the lobby, and the concierge can help you plan visits to local Carmel attractions. Couples love the Happy Landing Inn with its location just a short walk from Carmel Beach and numerous shops, restaurants, and art galleries. The inn has seven unique rooms that are perfect for romance. Room amenities vary slightly by room but include a queen, king, or double bed with space for 2 to 4 people. You can also request a specific room to get a fireplace, marble-topped dresser, cathedral ceiling, brass headboard, sitting room, leather sofa, bay window, or sleigh bed. The inn has cathedral ceilings, stained glass windows, plenty of gardens, and pet-friendly rooms. 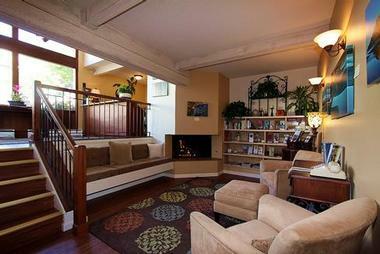 There is also an outdoor fireplace and spacious Great Room. 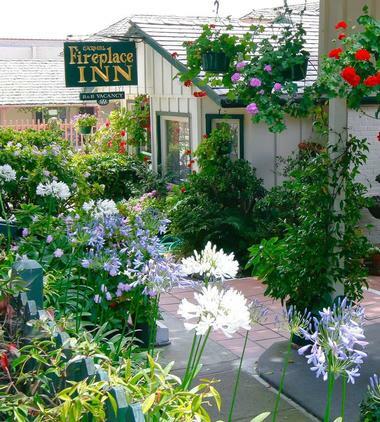 The Carmel Fireplace Inn is just a short walk from restaurants, shops, and the beach and provides a charming and elegant experience. 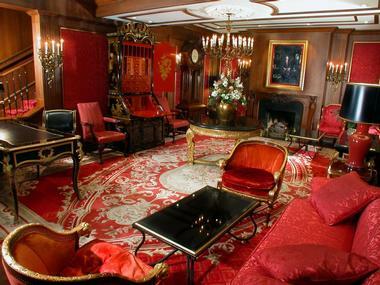 Each of the 18 rooms is uniquely and carefully decorated, and all rooms except one have a fireplace. Most rooms have king beds and you can even find Amish-crafted décor in some of them. They also have refrigerators, private baths, private entrances, hair dryers, irons, and wireless Internet. Some rooms are also pet-friendly. Families may prefer one of the three suites or the cottage. The entry path is lined with shrubbery, and there are tables and chairs from where you can admire the hanging pots, vines, and flowers. Guests get a light continental breakfast buffet in the morning and afternoon sherry and port. There is also a tea and coffee service. 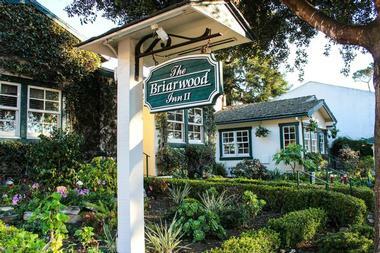 The Briarwood Inn invites guests with friendly hospitality and all rooms except one feature a private fireplace to create a cozy, romantic atmosphere. Every room is different, and many have king beds. The upscale amenities in the rooms include refrigerators, irons, hairdryers, extra blankets and pillows, and private baths. You can also request a pet-friendly room. There are also suites and cottages available for larger groups or families. Guests have access to free wireless Internet as well as over 200 different movies. The day begins with a light continental breakfast and the afternoon features port and sherry with tea and coffee service available. The Hofsas House Hotel is family-owned and features individualized and spacious rooms. Many of the 38 rooms have ocean views and all have Dutch doors to let in the ocean air. Most suites and some rooms also have kitchens, wet bars, private balconies, and fireplaces. The hotel features many decks from which you can admire the sunset on the Pacific Ocean. In the morning, guests have access to a continental breakfast featuring fresh local pastries, fruit, juice, tea, and French Roast coffee. Hofsas House Hotel also has free wireless Internet throughout the property as well as view deck areas, dry saunas, and a heated swimming pool. You can also choose a room that is pet-friendly. 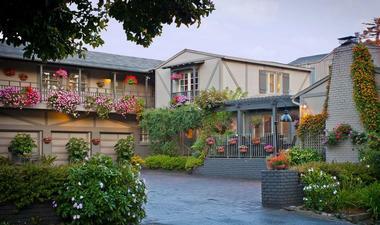 This boutique inn is right in Carmel and gives guests the choice between 18 unique rooms and suites. The inn has a strong wine history, and today you can find several packages with wineries. All rooms have a lighted makeup mirror, high-definition flat-screen TVs, wireless Internet, marble walk-in showers, terry bath towels, and memory foam beds. Guests can choose from a standard queen or king room, a king deluxe, a king suite, or the Honeymoon Cottage Suite. The inn features a relaxing space with a grand pergola and intimate gardens with a stone and glass fireplace. The inn also partners with many local wineries to provide guests with great offers. The day begins with a complimentary signature breakfast. 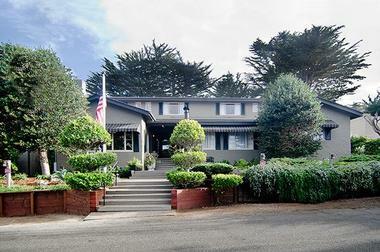 The Pine Inn is the very first hotel that was built in Carmel-by-the-Sea, and it dates back to 1889. The City of Carmel has listed it as a Historical Resource, and the hotel has an ideal location just four blocks from the beach in the heart of the town. This full-service boutique hotel offers elegant rooms with Aireloom Pillow-Top mattresses. Guests have a choice of a standard room, a deluxe room with a Jacuzzi tub and marble bathroom, or a suite for the ultimate luxury experience. 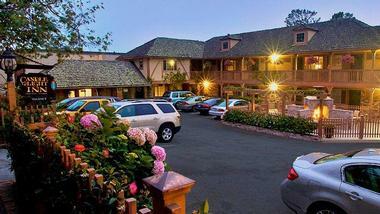 The Pine Inn has wireless Internet access throughout the building and limited parking. There is a complimentary American breakfast buffet on weekdays. The hotel also has an Italian restaurant, Il Fornaio, which is open all day and has a bar and bakery. 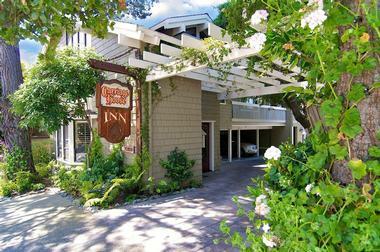 The Cypress Inn combines modern comforts and amenities with old-world charm. This inn has been a local hotel since 1929 and is pet-friendly. The buildings feature Mediterranean colors and rooms have fresh flowers, plush robes, luxurious linens, flat-screen TVs, and wireless Internet. Guests will also receive daily newspapers and wills surely appreciate the comfortable chairs, premium toiletries, iPod docking stations, and blankets and bowls for their pets. The inn offers breakfast in the courtyard and afternoon tea in the living room. There are also evening appetizers. Guests can enjoy lunch or dinner at Terry’s Restaurant and Lounge for local, organic food. 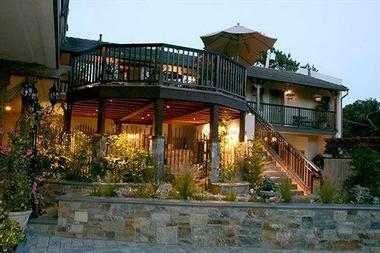 The excellent location of Lobos Lodge offers guests easy access to the beach, shops, and restaurants in Carmel. Every room has a small refrigerator, an in-room coffeemaker, a flat-screen TV, and wireless Internet. Guests can also request irons and ironing boards or one of the many rooms with a private balcony or patio for views of the garden. Each of the 30 rooms has two full-sized beds or a queen or king bed in an alcove as well as a private bathroom and a conversation area with a gas log fireplace and a sofa. There is on-site parking for guests and you are welcome to relax in the beautiful gardens. The complimentary continental breakfast is delivered to the rooms in the morning and it includes the daily newspaper, juice, fruit, and muffins. Guests are welcome to make their own coffee using the coffeemaker located in their room. 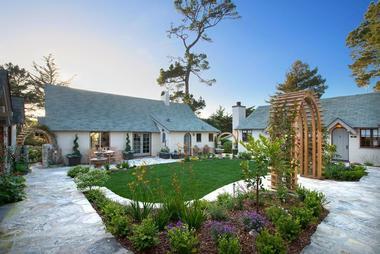 The Homestead was built during the early 1900s and blends the traditional charm of Carmel with great hospitality and amenities. The 12 guest rooms are inviting and spread throughout several buildings that resemble cottages. Rooms have one or two queen beds, a king bed, or a queen bed and a twin bed. Most have full baths while some simply have showers. Several feature gas fireplaces, exterior entrances, mini kitchens, or a full kitchen. Gorgeous winding stone pathways connect the various buildings, and guests can relax on the outdoor patio with its stone fireplace. The Homestead works with the nearby Mission Ranch to give guests access to their fitness center and complimentary pastries and coffee. 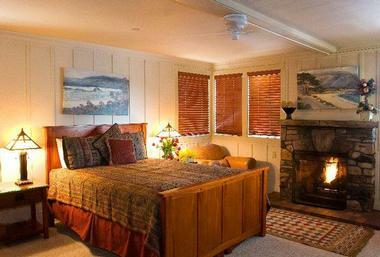 The elegant décor throughout this Carmel inn is perfect for romance and is just a short walk from nearby attractions. The 22 guestrooms or suites give you feather beds, luxurious Italian linens, and flat-screen TVs. All rooms also have Keurig coffee brewers and private bathrooms with showers. You can choose a room with a queen or king bed, a living room, a tub/shower combination, a fireplace, a personal jetted tub, a full kitchen, patio, an extra murphy bed, and/or an extra bathroom. Guests have access to wireless Internet throughout the property as well as irons with ironing boards. Guests also receive a daily newspaper and continental breakfast delivered to their rooms, and fresh cookies are available every day. 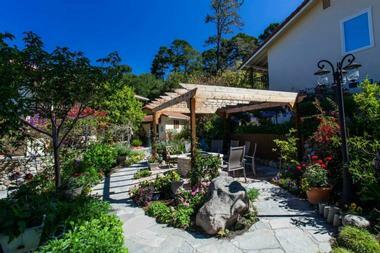 You may also like: Carmel Valley Ranch.